AN SSPX AGENT IN QUITO – In my last column I mentioned that I would write about an agent that SSPX has – or had – in Quito at the Convent of the Immaculate Conception. Her name is Jade Liboro. She is a Filipino lady based in Florida, U.S.. I know few details about her liaison with SSPX, except that it seems to be longstanding, at least since the late1990s. Here I will be analyzing only the fruits of her action, which are extremely advantageous for SSPX. Around 2014 she started to be seen in Quito. Shortly after, she was introduced into the Convent of the Immaculate Conception and was allowed to live there with the nuns for up to six months a year. The means she utilized for the introduction are not clear to me. 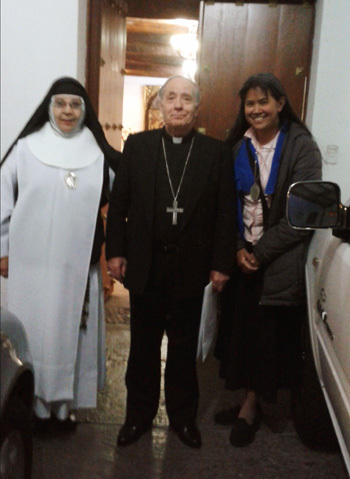 Some say that she was imposed by the “good” Archbishop Travez; others say that she had the backing of the Vatican Apostolic Nuncio to Ecuador, Msgr. Giacomo Otonello, who obliged the nuns to receive her. This is the information I have. When I say that she is living in the Convent, I do not mean that she became cloistered. She has free transit to go and come at will. Since about that time, she has been active in the major public activities of the Convent. I saw her in a very operational role in the Convent Church before and after the Masses (Novus Ordo and ’62) that were said on this last February 2, 2019. I even spoke to her when I needed information from someone inside the Convent. I noticed that she has a type of charm that consists in giving you the impression that what you just said to her is so extraordinary that she is in the brink of fainting from admiration: A flatterer. When Ecuadorian friends refer to her, they call her la China; when Brazilian friends speak of her, they say a Filipina; I will refer to her in this article as the Agent. I will analyze the four main goals that the Agent attained for SSPX. The consequences of this expulsion for the Convent and for SSPX. Should my analysis require it, I will post its continuation(s) in days to follow. 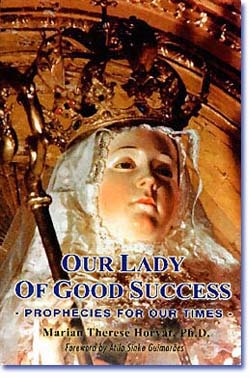 The first edition of Our Lady of Good Success – Prophecies for Our Times by Marian T. Horvat, Ph.D., was published in 1999; the second book she published is called Stories and Miracles of Our Lady of Good Success, with its first edition in 2002. For 20 years Tradition in Action has had the honor to be among the first organizations, if not the first, to publicly disseminate this devotion in the English language. This position gave us conditions to become aware of different maneuvers orchestrated to silence our work or steal the banner. 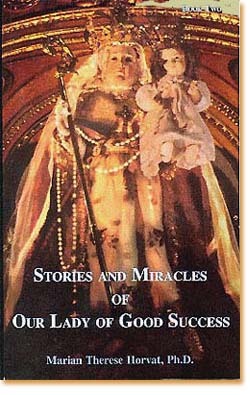 The two books that launched the devotion of Our Lady of Good Success in the U.S.
As soon as the devotion to Our Lady of Good Success began to reach a larger audience in the U.S. propelled by TIA and The Apostolate of Our Lady of Good Success, some people began to say that it was not the correct devotion that should be spread from Quito. The important devotion coming from that city, they claimed, was that of Our Lady of Sorrows. In fact, this famous devotion of Our Lady exists and has long been relevant in that city. Who were those persons? They were the SSPX grassroots, who had heard that criticism from their priests. Since this first attack did not prevent the books and devotion to Our Lady of Good Success from spreading, new rumors started that the translation of the title Our Lady of Good Success was wrong. The true translation to English should be Our Lady of Good Fortune. The source of this rumor was one of the SSPX Bishops. From the same sources came the next attack: The genuine translation of the title would be Our Lady of Buen Suceso of the Purification. 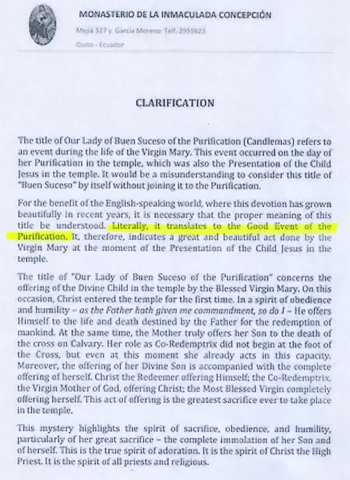 The most recent attack is that the real translation for the Spanish title in English is Our Lady of the Good Event. Again, it comes from SSPX. As the reader can see, we have been under a crossfire of “real translations” whose practical result is to create confusion among those interested in knowing and spreading this devotion. In parallel to these linguistic diversions, another initiative sprung up: From different places TIA received proposals to translate Dr. Marian’s first book – Prophecies for Our Times – to other languages: German, Italian, Polish, Japanese, Vietnamese, etc.. I had a suspicion that someone from SSPX was sending those persons in order to obtain permission, so that the organization could – based on the copyrights of the translator – reprint as many copies it wanted and order as many translations it deemed fit. Some reader might think that I am too suspicious. However, this hypothesis was confirmed when a very pleasant naïve SSPX nun from Germany on a pilgrimage to Quito approached Dr. Horvat, who also was there, and proposed more or less what I had suspected. Later, she visited our office in California to make a more formal request of TIA's copyrights. With these presuppositions in mind and given the intense activity of the Agent inside the Convent, we at TIA were not surprised when the new Mother Abbess issued a document in 2017 declaring that the correct name in English for the devotion of the Spanish name Nuestra Señora del Buen Suceso y de la Purificación was Our Lady of the Good Event and of the Purification. The document and its English translation can be read here. The Clarification announcing the name change alleges that the word Suceso in Spanish only translates well in English by the word Event. This document dated July 1, 2017, is signed by the Mother Abbess, the Vicaress and two Counselors. A second document approving the first is signed by “the good” Archbishop Travez. These documents were made public by the Convent’s website, which, practically speaking, was created only to publish them, since the site is “under construction” and the other matters are of little relevance. When the Convent considered creating a website, an American lady without links to the SSPX offered to build it for the nuns; she was dismissed by the Agent who told that lady she would take care of it. These documents translated to English are now being presented by the SSPX priests as the final decision on the topic. We at TIA have been already urged by an online video producer influenced by the SSPX to change the name of the devotion on our website as well as in the titles of Dr. Horvat’s books. As I described above, for many years prior to 2017 SSPX has tried to impose a change on the name of the devotion. So, the fact that the Agent has been acting energetically in the Convent since around 2014 induces us to think that she has arranged a way to obtain a document that gives approval to what SSPX wants. 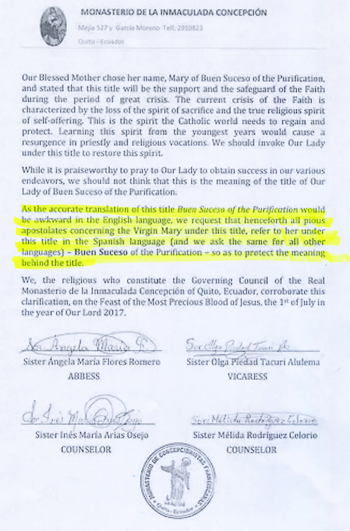 The present-day Mother Abbess, as well as the other three religious women who signed the mentioned document, have no idea of what would be the appropriate way to translate the title Nuestra Señora del Buen Suceso from Spanish into English, because they do not know English. As far as I could verify with friends from Quito who have access to the Convent, there is only one nun in that community who is fluent in English, but she does not pretend to decide what is or is not conventional in English. Therefore, the probability increases that that document was presented to the signers by the Agent. The reason why the Abbess signed – out of obedience, fear or convenience – extends beyond the purpose of this article. For many years both the previous Abbess and the new Abbess, who before was a person of relevance in the Convent, were quite aware of the devotion of Our Lady of Good Success, with this precise title, in the United States as spread by TIA and others. In 2011, while she was in Quito, Dr. Marian Horvat personally gave the previous Abbess – at the latter’s request – her books in which the title Good Success appears. Before that date there was correspondence from the TIA to the Convent in which the same books and brochures advertising them were sent. During that time never was an objection to the title Good Success raised. Further, Mrs. Kathy Heckenkamp, who is the head of the Apostolate of Our Lady of Good Success in the United States, for 19 years had close contact with the previous Mother Abbess in her constant visits to Quito. She also made frequent telephone calls from the United States to that Abbess. During all those years of friendship and correspondence, the Mother Abbess was perfectly aware that the name Our Lady of Good Success was being used and never raised any objection to it. Therefore, the change of position can only be explained by the intervention of a new factor. This factor seems to be the Agent working for SSPX, pressuring the new Abbess to change the name of that devotion. It is not usual in the Church to dictate the names of devotions, especially in their translation to other languages. Normally, the Catholic Church allows the devotions to grow organically and, so long as they do not spread any doctrinal error, it is left to the faithful to determine the name under which they wish to venerate the Most Holy Virgin Mary. So, the decree of the Abbess of the Quito Convent sounds awkward, reinforcing the impression that it was imposed to benefit the SSPX. These are the reasons why I believe that the document in question is not binding.